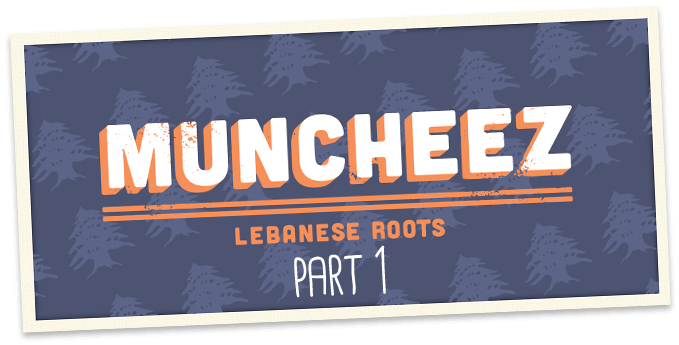 Over the next month the Muncheez Founder will be traveling back to Lebanon to keep evolving the Muncheez brand through old and new Lebanese traditions. In our 4-blog post series we will share the details of the Muncheez story never heard before. This series will journey through the creation of Muncheez, the logo, the brand, the food and its culture. And most importantly, to wrap up our journey we’ll share a video showcasing the beauty of Lebanon so those who have never been might get one step closer to making it happen, and for those who have been, a sweet reminder of its majestic beauty. To understand the Muncheez brand it is important that I share some aspects of my life that have pushed me to evolve the brand to where we are today. Over the years I developed a list of my favorite spots around all of Lebanon, after a lot of trial and error. Fast forward to college, I left my hometown and came to the US (I went to Duke University). During my college experience (College in the US is great BTW), there was an integral part of my everyday life that was missing, Lebanese street food. Unfortunately Durham was not the ideal place to satisfy my food cravings, but I am thankful because that void pushed me to want to share all my wonderful experiences with Lebanese cuisine with people in the US by creating Muncheez. In my senior year, the idea of opening a Lebanese fast casual concept started to come to fruition. I had such a wonderful experience growing up in Lebanon that I wanted to share it with the world. And to the best of my knowledge, I felt Muncheez would be my way of doing it. I will go into detail on how I came up with the pillars that I wanted the Muncheez experience to be built on: Food, customer service, Experience, Lebanese culture. Creating the Muncheez menu was easy. All I did was jot down all my favorite street foods I grew up on on a piece of paper. If you ever go to Lebanon you can visit these places to get a feel for my inspiration: Boubouffe’s Shawarma, Sahyoun’s Falafel, University Crepie’s Crepes, Ghattas’s Baked Goods, Zaatar w Zeit for the Americanized Manakeesh and its late night cravings, Freddie’s Hot Dog, etc. Keep an eye out for our next blog post for an in-depth look at Lebanese street food vendors! In Beirut we’re a little spoiled in terms of service. One word that we rarely hear is “No” when it comes to requests in the food industry. Servers accommodate some crazy requests just to make the customer happy. And I wanted to replicate that attention to guests’ needs at Muncheez. You will rarely hear a “No” to your request. Please visit and test our a request for yourself. I am curious to hear your requests and happy to show you how we deal with a challenge. I am convinced that delivering happiness to a customer is the number one priority of the hospitality business, and we will not shy away from an opportunity to do that. Once again, I believe we’re spoiled in Lebanon in terms of foodie experiences (maybe New Yorkers are even more spoiled!) where you can satisfy your cravings anytime of day. I still remember hanging out at Zaatar w Zeit in the wee hours of the morning, extending the life of the party, sharing and conversing with friends (and sometime strangers) over some food, music and good vibes. It was a hangout that provided some good memories, and some good times that I may or may not remember. I decided that I wanted Muncheez to be more than just a restaurant; I wanted it to be a place to hang out day and night. Which is why we are open most hours of the day (on weekends we close at 4:30 AM!!). You can kick it with a friend whenever you get the Muncheez. You might even bump into more of your friends. 😉 Our recipe is good food, funky tunes and good vibes… A toast to the good life! 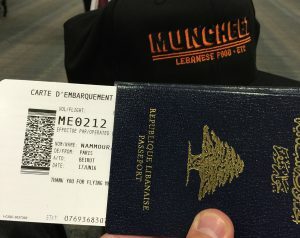 It is only recently that I started to incorporate Lebanese culture at Muncheez. This is a sign that we are evolving in the right direction. For such a small country, Lebanon is rich in tradition, culture and art. There is a mix of Eastern and Western culture that gels perfectly. It is important to me to be able to share some positive cultural aspects of Lebanon. Since all you hear about Lebanon in the news is political corruption, instability, garbage crisis, refugee crisis and the aftermath of a civil war that almost sent the country into the abyss. Whether it is an insight from Gebran Khalil Gebran (writer of the prophet, we just painted a quote on the Muncheez wall) or up and coming artists that are expressing themselves through their art (Yazan Halawani, Hania el Rayess, Michel Karsouny, Emile Issa, etc. ), Muncheez will keep promoting and supporting these creatives by including some of their work in our stores. Visit us to get a sense of what these artists are capable of! One year ago, I decided to re-brand Muncheez. Here’s an example of my thought process for selecting my logo. I truly wanted the logo to have some meaning to me and represent the brand I was trying to create. In coming up with the logo, I knew that I had to have some reference to Lebanese food since Muncheez can be anything (duh! ), and that is where we got “Lebanese food”. And since I wanted it to be more than just food, we came up with the “etc.” part. Since I began the concept in DC, I wanted to add a local touch to it, so we added the two lines!! And last but not least, for the Muncheez colors, I picked my high school colors (Notre Dame de Jamhour). Et voilà!